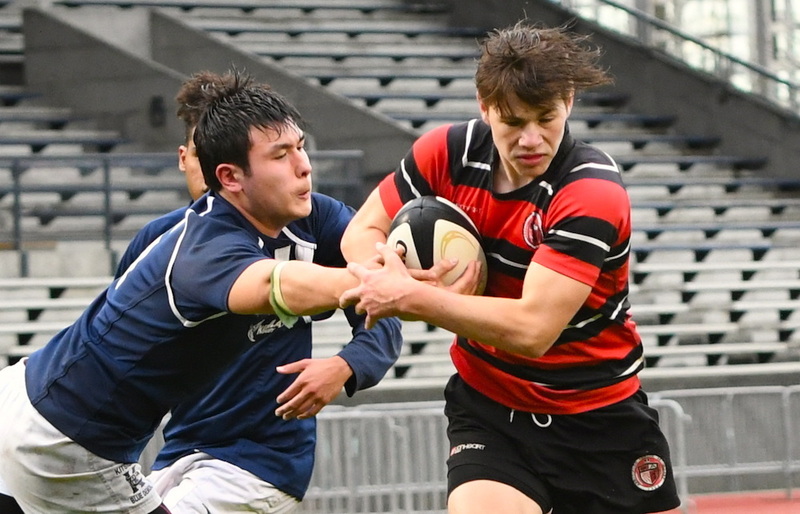 Welcome to Varsity Letters’ B.C.high school rugby report. Today, the focus sits squarely on the opening week of the Stadium Series. VICTORIA — The Stadium Series match-makers didn’t miss a beat to start the 2019 B.C. senior boys rugby season, especially as it concerns the big four Quad A programs. While St. George’s was using last-second heroics to beat Shawnigan Lake 15-13 at Swangard on Friday, flipping the script on the Stags’ victory over Saints in last season’s B.C. Quad-A semifinal, the same reversal of fortunes was being authored at Victoria’s Centennial Stadium. Carson Graham’s Austin James took a loose ball and broke several tackles before sprinting free for a 50-metre try in the dying moments of play, lifting North Vancouver’s Eagles to a 25-22 win over the host and defending B.C. champion Oak Bay Barbarians in a re-match of last season’s B.C. Final Four clash won 52-10 by the provincial capital crew. Carson Graham had scored four first-half tries, all part of an offensive booty which pushed them out to a 20-10 halftime lead. Yet an Oak Bay squad which lost 10 starters to graduation, regrouped and began to work their way back into the game with some hard line breaks in the second half. A try was scored near the sideline and Barbs’ kicker Jack Carson was somehow able to slot the conversion from the tough angle in the wind to bring the score to 20-17. Then, with about five minutes to go, Oak Bay’s Carson powered his way through the defense to score an emphatic try, and although the convert was missed, the home team had its first lead of the game at 22-20, setting the stage for James’ end-game heroics. VICTORIA — The third time was not only the charm, it also showed the forward progress being made by Vancouver’s Sir Charles Tupper Tigers. Opening their Stadium Series schedule on Vancouver Island for a second straight season and facing Victoria’s host Glenlyon Norfolk Gryphons for the third time in recent history, the Tigers got into an early groove en route to fashioning an impressive 19-point win. As the game kicked off, Tupper was able to take advantage of the wind at their backs when they kicked deep into GNS territory, recovering the ball and going to the short side where prop Ben Holtz was able to go over for the first score of the game and a 5-0 lead. On the ensuing kickoff, the Gryphons’ back-row forward was able to recover the kickoff from the Tigers before mounting a barreling run through the forwards to go over the touch line. Unfortunately for the home side, he knocked the ball on as he dove across the line. A bullet dodged for the Tigers, it set the stage for tries by both Josh Soquila and Holtz over the final 10 minutes of the opening half as Tupper took a 17-0 lead into the break. Glenlyon Norfolk came straight out of the gates in the second half and were again able to capitalize off the kickoff when a second row player broke multiple tackles on his way to the end zone, making the score 17-5. Near the end of the half, Tupper was finally able to break through the GNS defence to score its fourth try of the day by Kiya Vivier-Miller. Prior to Friday’s win, Tupper had lost to Glenlyon Norfolk twice at the provincial tournament, in both 2017 and 2011. BURNABY — The best is yet to come. That’s not only a pretty good bet when it comes to the season which lies ahead for the Abbotsford Panthers, but also for their future over at least the next couple of campaigns. Yet the Panthers’ 25-man roster, back-loaded with 20 Grade 11s, looked plenty good enough already on Friday in its Stadium Series win over Vancouver’s Kitsilano Blue Demons at Swangard Stadium. The Panthers took the lead early thanks to the clever line break of captain Josiah Levale. Stout defense by flanker Will Taggart and scrum half David Coronado frustrated Kits for much of early part of the match. On the day, Levale and Coronado each supplied a pair of tries to the winning cause. Gavin Smith and Koby Ashton each supplied one try, with Ashton also kicking a penalty and three converts. Levale was especially impressive with his decisive line running and dogged defense while teammate Luke Pearson brought not only an incredible work rate but his ability to gain metres in tight spaces. SURREY — Outside centre Ben Julien scored five tries and kicked three converts, while No. 8 A.J. Julien found touch on two occasions as Courtenay’s G.P. Vanier Towhees topped Richmond’s R.A. McMath Wildcats 41-14 on Friday at South Surrey Athletic Park. Stanely Nowark at open-side played a very good defensive game while inside center Kevin McMillian was a threat offensively but moreover a defensive shut-down specialist, often stopping attack and creating turnover ball. BURNABY — West Vancouver started with the greater share of possession but Earl Marriott’s defence was stout over the opening 15 minutes. After that, the Mariners turned the tide off a turnover ball, and three passes later, Takoda McMullin sped down the sidelines for the game’s opening score. When Earl Marriott had the ball they were electric in attack and stymied the West Vancouver attack very well with their pressure defence and the powerful play of its twins, Takoda and Talon McMullin. Sam Larue and Eric Neihbur were also impressive from a tackling standpoint. SURREY — A ferry ride, plenty of rain and wind at South Surrey Athletic Park, and then an early 7-0 deficit. None of it was enough to deter the Nanaimo District Islanders, who scored all of their 17 points in unanswered fashion Friday. Midway through the first half, the Islanders pulled out a trick play at the line-out to give captain Kurt Schnablegger a short throw at the five-meter mark. He then charged over the line to pull the visitors to within 7-5. NDSS was able to push forward into Elgin Park territory throughout the early stages of the second half, and after swinging the ball wide to impact player Elijah Beauchemin, who came in with fresh legs off the bench, the Isles’ were able to take their first lead of the match. Beauchemin burned his opposing winger before finding high gear and splitting through the cover tackle and going under the post. Grade 10 fullback Dylan Cleaver nailed the conversion to make it 12-7 with 10 minutes remaining. Lock Patrick Behei drove a pick-and-go over the line to seal the game at 17-7. NORTH VANCOUVER — What a difference a season can make. The Handsworth Royals were the ones on the short end of the score a season ago when they opened Stadium Series 2018 with a loss to Abbotsford’s W.J. Mouat Hawks. On Friday at Klahanie Park, North Van’s Royals flipped the script in decisive fashion. Handsworth scored nine tries in the shutout win, highlighted by a 60-metre sprint to touch from Steele Young and a 40-metre try from Harry Jarret. Darren Colpitts more than complimented the pair, stealing three line-outs and scoring off of two mauls. 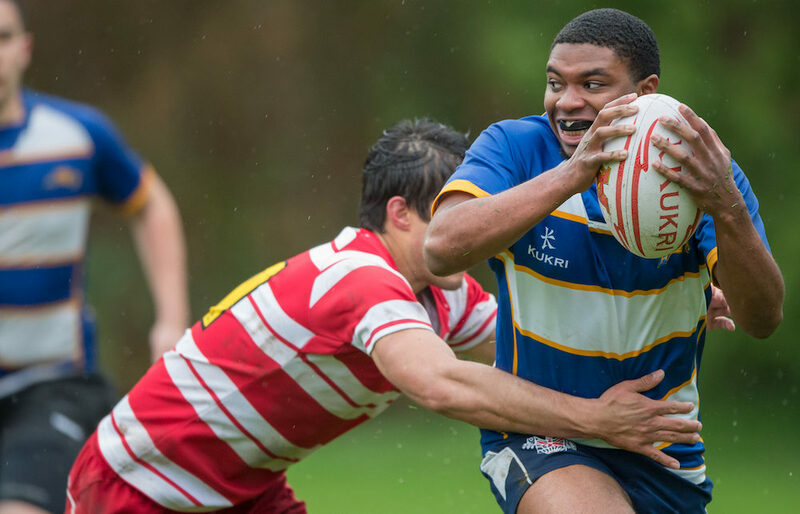 New to rugby, UBC-bound football man Erik Dikka got some playing time for Handsworth and showed he will be a player to watch through the season. VICTORIA — Long time Island rivals SMUS and Brentwood opened their respective 2019 seasons in the first round of the BCSSRU Stadium Series, with an entertaining, 11-try spectacle at UVIC’s Wallace Field. Making light of a strong cross wind, both teams looked to attack from all over the field, with many fine tries the result. SMUS started strongly, recovering the opening kickoff before Jacob Robb dove in close to the posts. The Blue Jags struck again almost immediately, with scrum half Max Nishima doing the honours. Two Alec Kinahan conversions made it 14-0. Brentwood then registered its first score, as Jacob Bossi ploughed over. Blake Cleasby added the extras. Yet, SMUS replied in short order, Kinahan going over under the posts from Robb’s offload to stretch the lead to 21-7. An Andrew Garnett try, with a Cleasby conversion, pulled Brentwood back within seven points, but the Jags finished the half strongly, as centre Elvis Duru and right wing Jack Batoni each scored in the right corner to stake SMUS to a commanding 31-14 at intermission. The second half began in the same fashion, with Duru notching his brace as SMUS went up 38-14. However, the game then changed, as Brentwood totally dominated possession and territory for the next 20 minutes. Tries from Torren Kaiser and Arnau Torrent, both converted by Cleasby, closed the gap 38-28 with nine minutes remaining. Fortunately for SMUS, a superb 40-meter break from Kinahan, much against the run of play, produced a final try and effectively blunted the Brentwood momentum. The Blue Jags’ Kinahan finished the game with a 20-point haul, from two tries and five conversions. No. 8 Jamie Scott, loose head prop Josh Mao and fullback Ben Shaw also enjoyed strong performances. SURREY — Some days you’re the hammer, some days you’re the nail. After getting hammered by R.E. Mountain on Tuesday, Surrey’s Lord Tweedsmuir Panthers decided not to be on the receiving end as they met North Vancouver’s Argyle Pipers on Thursday in the first game of Stadium Series 2019. The Panthers’ feisty scrum-half, Colby Nestman, drew first blood for the home team by diving in for the first of eight Tweedsmuir tries from about three metres out. The Panthers’ Man of the Match was Jesse Goedman, who scored on two long runs in the backfield which electrified his teammates. Graeme Godard delivered another try along with some solid defensive work and was inspirational throughout the contest. Panther forwards Dylan Dosanjh, Morgan Sandford, Mason Godard and Addison Sadler all were rewarded with tries for their tenacity. Adam Kwok booted two and added a try of his own to round out the Panther scoring. Kurt Strothers and Dave Lisle scored tries for a gutsy Argyle squad. BURNABY — When last we left one of the best rivalries in all of B.C. high school sports, the contrast between that old cliche of the ecstasy of victory and the agony of defeat was about as pronounced as you will find. Their No. 1 strength was their resiliency, and when you put the two together in a such a time-honoured rivalry game, you can most definitely count the 2019 campaign as officially underway. After a turnover filled first half in which St. George’s led 3-0, Thomas Kirkwood recovered a Shawnigan turnover with 23 minutes remaining in the match, and over the course of a dynamic 22-metre run, put on a pair of brilliant fakes, including one which froze two Stags at the touch line. Shawnigan Lake, which last season was upset in the provincial final by Oak Bay after having won three straight B.C. titles and eight of the previous nine, tipped their collective hat to Saints’ effort. That’s a massive, detailed, thorough and fantastic summary – thank you Howard!